WASHINGTON (AP) — After the Big Bang, it was cold and black. And then there was light. Now, for the first time, astronomers have glimpsed that dawn of the universe 13.6 billion years ago when the earliest stars were turning on the light in the cosmic darkness. And if that’s not enough, they may have detected mysterious dark matter at work, too. The glimpse consisted of a faint radio signal from deep space, picked up by an antenna that is slightly bigger than a refrigerator and costs less than $5 million but in certain ways can go back much farther in time and distance than the celebrated, multi-billion-dollar Hubble Space Telescope. “If confirmed, this discovery deserves two Nobel Prizes” for both capturing the signal of the first stars and potential dark matter confirmation, said Harvard astronomer Avi Loeb, who wasn’t part of the research team. Cautioning that “extraordinary claims require extraordinary evidence,” he said independent tests are needed to verify the findings. Bowman agreed independent tests are needed even though his team spent two years double- and triple-checking their work. “It’s a time of the universe we really don’t know anything about,” Bowman said. He said the discovery is “like the first sentence” in an early chapter of the history of the cosmos. This is nothing that astronomers could actually see. In fact, it’s all indirect, based on changes in the wavelengths produced by radio signals. The early universe was dark and cold, filled with just hydrogen and helium. Once stars formed, they emitted ultraviolet light into the dark areas between them. That ultraviolet light changes the energy signature of hydrogen atoms, Bowman said. Astronomers looked at a specific wavelength. If there were stars and ultraviolet light, they would see one signature. If there were no stars, they would see another. They saw a clear but faint signal showing there were stars, probably many of them, Bowman said. Finding that trace signal wasn’t easy because the Milky Way galaxy alone booms with radio wave noise 10,000 times louder, said Peter Kurczynski, advanced program technology director for the National Science Foundation, which helped fund the research. “Finding the impact of the first stars in that cacophony would be like trying to hear the flap of a hummingbird’s wing from inside a hurricane,” Kurczynski said in an NSF video. Because the high end of the frequency they were looking in is the same as FM radio, the astronomers had to go to the Australian desert to escape interference. That was where they installed their antennas. They then labored to confirm what they found, in part by testing it against dummy signals in the lab, and it all showed that what they spotted was the existence of the first stars, Bowman said. 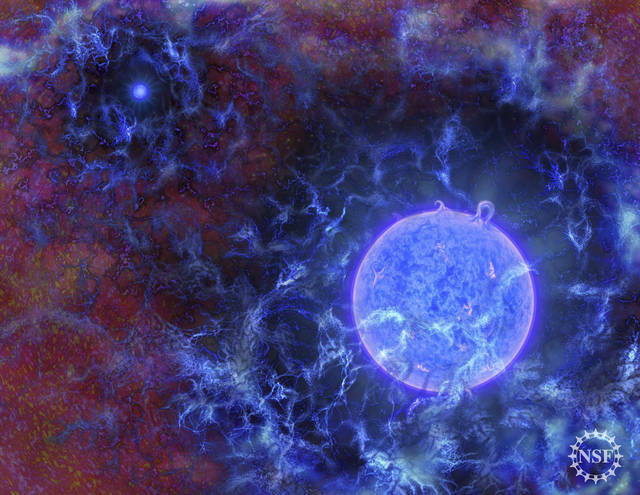 So far, the scientists know little about these early stars. They were probably hotter and simpler than modern stars, Ellis and Bowman said. But now that astronomers know where and how to look, others will confirm this and learn more, Bowman said. When this signal was found and examined, it showed that the hydrogen between stars was “even colder than the coldest we thought possible,” said Rennan Barkana, a Tel Aviv University astrophysicist who wrote a companion study on the dark matter implications of the discovery. The researchers expected temperatures to be 10 degrees above absolute zero, but they were 5 degrees above absolute zero (minus 451 degrees Fahrenheit, or minus 268 degrees Celsius). “The only thing we know from this signal is that something very weird is going on,” Barkana said. What seems likely is dark matter — which scientists have never seen interacting with anything — may be cooling that hydrogen, he said. Dark matter makes up about 27 percent of the universe, but scientists know little about it except that it’s not made of normal matter particles called baryons. 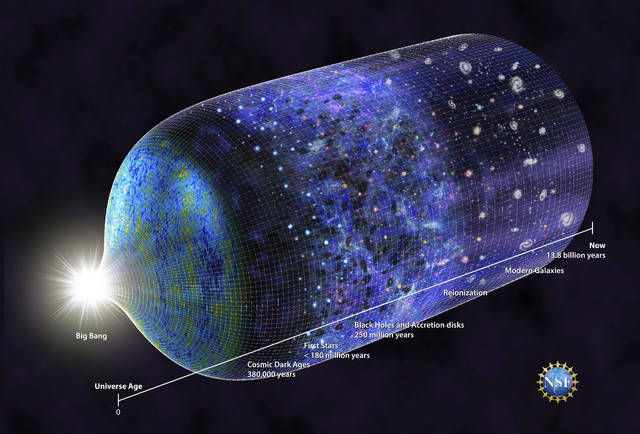 Scientists have known dark matter exists, indirectly, through measurements based on gravity. If this interpretation of the data is correct, it would be the first confirmation of dark matter outside of gravity calculations, Barkana said. It also potentially reveals something new about the nature of dark matter.